Doha, Qatar – January 9, 2018 – Challenges and benefits at the crossroads of geopolitics and higher education is the focus of Northwestern University in Qatar ’s annual report. In the document, published in December, NU-Q’s Dean and CEO Everette E. Dennis appraised the “resilience and resolve” with which the school, its sister institutions in Education City, and the State of Qatar have navigated the continuing Gulf crisis and blockade of Qatar since June 2017 to the present. The 2017-18 academic year, the school’s 10th year of operations, welcomed its largest freshman class to date and saw a 17.7 percent growth in the overall student body with 53 percent being Qatari citizens and others coming from 25 countries. Inspired by the architect Antoine Predock, who designed the 515,000-square-foot NU-Q building featuring the infrastructure of a television network and a movie studio and who declared that the structure is “an instrument to be played,” the leadership of the school was determined to make creative and effective use of their new home. The year saw the opening of the school’s state-of-the-art robotic Newsroom at a special dedication ceremony. NU-Q sought a coherent strategy that included shared governance with its faculty, staff, and students whose voices are heard through a raft of committees and task forces that took on challenges ranging from community building to outreach, an innovation/futures lab, and new emphasis on pedagogy to keep the school on a dynamic trajectory. A self-conscious approach to the siege of Qatar that has had an impact on the country, its security, and its economy as well as individual families has inspired faculty and student research projects, classroom lectures, and discussions. It also led to a new Creative Media Festival whose theme was “Boundaries and Borders” and yielded multiple student projects. That effort was led by two Northwestern communication graduates, the Broadway producer Tom Casserly and his colleague, anthropologist George Bajalia of Columbia University. The two were joined by the award-winning actor Caitlin Cassidy – all of whom donated their time to the enterprise, which involved a 48-hour round-the-clock festival. Students also produced documentary films and journalistic reports to document the impact of the blockade. Early in the academic year, Qatar's Emir, His Highness Tamim bin Hamad Al Thani, made an electrifying visit to the school with a CBS camera crew for an interview that appeared on the famed program “60 Minutes.” Her Excellency Sheikha Saif Al-Thani, director of the Government Information Office, discussed Qatar’s response to the information war that has characterized the siege. H.E. Sheikha Hind Hamad Al Thani, CEO of the Qatar Foundation and co-chair of NU-Q Joint Advisory Council, made several visits to the school for meetings and events including a session with all of Education City’s deans. Major speakers during the year included broadcast interviewer Fareed Zakaria of CNN and Oscar award-winning actress Sharmeen Obaid-Chinoy who addressed the graduating class. Other highlights of the year included an inaugural Executive Education program with masterclasses on “Sport, Media, and Business.” Concurrently, the school’s robust research program that includes an annual Media Use in the Middle East study across several countries published its latest report as well as an interactive website. Additionally, a Five-Year Retrospective of the study covering data from 2013 to 2018 was also published. The annual report also chronicles a record of faculty research including major books, monographs, book chapters, scholarly papers, journalistic reports, award-winning documentaries, and narrative films—and even a novel produced by members of the faculty and staff. Student research is also in the report. The report details academics and research, student life, outreach, and thought leadership in the school. 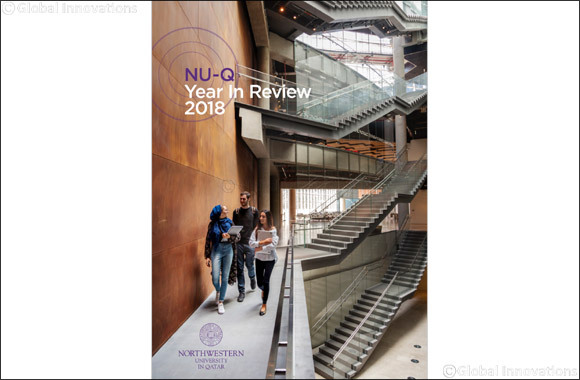 The NU-Q Year in Review can be found online.